Vampirina is one ghoulish gal who's a little batty, but also capable of having a total blast. If your daughter loves watching her stellar musical performances on Disney Junior and all the adventures going on in her family's infamous Scare B&B, then this category filled with Vampirina costumes is perfect for her. Vampirina is one fang-tastic friend and little girls can now disguise themselves with officially licensed costumes! Vampirina is a computer-animated Halloween-themed fantasy TV series little girls go batty over. And why wouldn't they? Vampirina "Vee" Hauntley is a young vampire who's so much more than a basic-bloodsucker. She's a lead singer of a slammin' band called "Ghoul Girls", she's also adept at playing the 'spookulele' (cute, right?! ), and she's a natural at making friends. One would think that being the new girl, and a vampire no less, at a typical Pennsylvania school would be intimidating but Vee is a natural at making friends. She's full of life, an accepting little girl and a high-energy spitfire who is great at turning any negative into a positive. Vee is also a member of a kooky, but cool family and loves her parents and grandparents very much, even Demi, the ghost who lives with the Hauntleys. Even though she's a pint-sized vampire, she's also a great role model for kids, not to mention her overall appearance makes an awesome costume for Halloween. We'll give you a round-up of all the costumes and accessories featured in this category so your little girl can have a completely immersive experience as the one and only Vampirina. 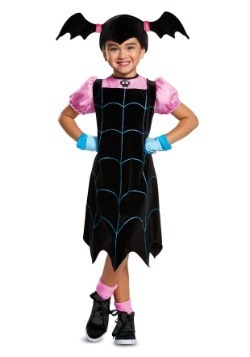 First and foremost, there's the officially licensed Disney Vampirina classic girl's costume. It comes with everything needed to achieve a ghoulish glow. First, we'll explain the costume in full detail. You'll receive the dress, headpiece and gloves. The pullover glitter spider-web dress with tattered hemline has an attached satin-like shirt attached underneath, creating one simple garment that looks like two separate pieces. The attached undershirt feels satin-like with puffy sleeves. A pair of blue gloves is included with the character dress as well as her most notable trait, a batwing pigtail headpiece to complete the cartoonish disguise. The deluxe version of the aforementioned costume is basically the same, except this one comes with more accessories, giving Vampirina-obsessed-little-ones an all-encompassing costume experience. In addition to the dress, leggings and headpiece, the deluxe Vampirina costume comes with a pair of fingerless gloves and a pair of boot covers. Little girls will look batty from head-to-toe! Last but not least, we have Vampirina accessories so little ones are able to really jam out like they're a member of the "Ghoul Gals." Your daughter can sing such songs as "Livin' the Scream" and "Mummy Rap" with the spookylele toy. 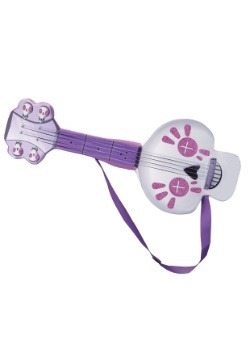 It's shaped like an adorable sugar skull with pink, sparkly eyes and an adjustable strap for easy transportation. Once the buttons are pressed, some favorite catchy Vampirina tunes will boom through the speakers. 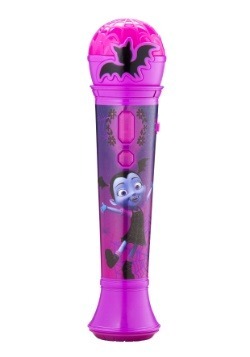 We also have a Vampirina microphone, capable of hooking up to an MP3 player. She can really put on a spooktacular performance with this! 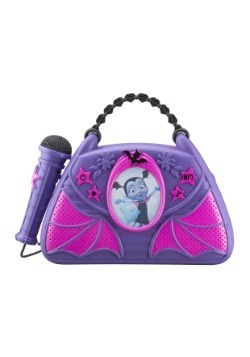 The Vampirina sing-along boombox comes with a real, working microphone and also plays some scary-cool jams. 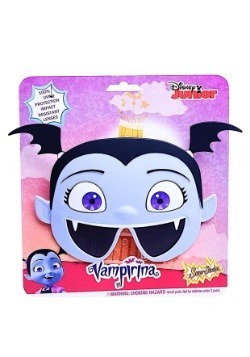 Last but not least, there are Vampirina sunglasses which shield eyes with 100% UV protection while also serving as a half mask!